I am a qualified historian, yet I choose to spend most of my life analysing numbers and baking cakes. 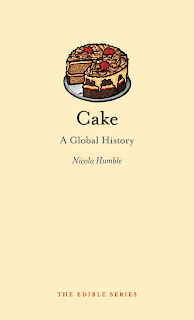 Can you imagine my excitement when I stumbled across a book called 'Cake - A Global History'? This is not another book about the Victoria Sponge, but rather a credible account of cake throughout the ages, what it symbolised to those making it and how baking skills were developed. Nicola Humble is a Professor of English Literature at Roehampton University, and gives us a whistle-stop tour of how the modern cake came to be. Humble takes the reader on a magical mystery tour of the progression of cake from a yeast based sweet bread, past the discovery of primitive raising agents such as pearl ash, through the opulent patisseries where culinary delights such gateaus were created, right up to the modern day emergence of the cupcake store movement. She looks at the representation of cake in the arts and the significance it has on the characters, from Miss Havisham's rotting wedding cake, Alice's discovery of the forbidden cake tempting her to 'Eat Me', to Anne of Green Gables' disappointment after accidentally using anodyne liniment rather than vanilla. The book is only 116 pages long, so can easily be read in a weekend, or in my case in-between blogging, baking and whilst sitting in the hairdressers. It's a fascinating little read which I would highly recommend to anyone who enjoys a slice of history with their cake and cuppa. Disclaimer: I reviewed this book because of my obsession with cake and history. I received no payment from the publisher for doing so. Read more about the series at The Edible Series.